It was concerning enough when in January 2018, the anti-abortion group Operation Rescue encouraged followers to look into the allegations of an anonymous conspiracy theorist on the 8chan message board. 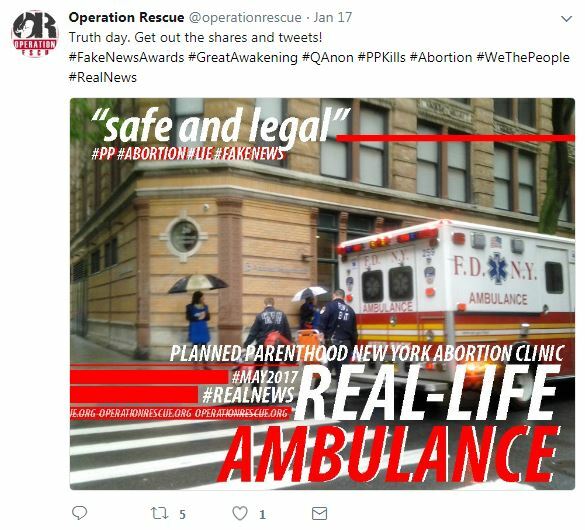 Now, it appears that Operation Rescue, with its history of violent rhetoric and harassment, has become fully converted and is seeking to cultivate anti-abortion followers into believers in a far-right conspiracy theory. Headed by longtime extremists Troy Newman and Cheryl Sullenger -- the latter has served time for conspiring to bomb an abortion clinic -- Operation Rescue has been described as an organization dedicated to “shut[ting] down abortion clinics by systematically harassing their employees into quitting.” Operation Rescue initially signaled that they’d been “red-pilled” -- a term popularized by the “alt-right” to refer to an ideological conversion to “seeing the world as it really is” -- in a January 7 press release, in which the group signal-boosted a series of posts from a far-right community on 8chan. In the January 7 release, Operation Rescue focused on an 8chan conspiracy theory called “The Storm” in which a user who refers to himself as “Q” claims to be a “high-level government insider” secretly sharing clues to “inform the public about POTUS’s master plan to stage a countercoup against members of the deep state.” The scope of the conspiracy theory has expanded to encompass all types of events, ranging from a fire at Trump Tower to a train accident involving Republican members of Congress. Most recently, followers of The Storm have joined a campaign calling for the release of a four-page classified memo drafted by House intelligence committee Republicans that allegedly shows illicit behavior by the FBI and Justice Department during the early phases of investigating connections between Trump associates and Russia -- a campaign organized around the Twitter hashtag #ReleaseTheMemo. According to The Daily Beast, right-wing figures as well as online message board communities “have since turned the hashtag into a rallying cry, imploring fans to tweet the hashtag.” On February 2, the President Donald Trump authorized the release of the memo, despite explicit warnings from the FBI about the veracity of its contents. In the January 7 press release, Operation Rescue acknowledged that "Q" is a conspiracy theorist -- or at least inspires conspiracy theories. Since then, the social media activity of the group and its leadership indicates that they’ve gone full Sean Hannity. Between January 7 and February 12, both Sullenger’s Twitter account and the official Operation Rescue account have increased their engagements with accounts promoting #ReleaseTheMemo and related hashtags (#Qanon, #TheGreatAwakening, #FollowTheWhiteRabbit). In the past month alone, Sullenger’s changed her account handle to “CherylS sez #ReleaseTheMemo” and followed a number of right-wing media personalities’ accounts, including Alex Jones, Jerome Corsi, Paul Joseph Watson, Mike Cernovich, Sean Hannity, Tucker Carlson, Mark Levin, and Sara Carter. January 10 -- Sullenger tweeted a National Review article and included the hashtag #Qanon. January 16 & 17 -- Operation Rescue sent a press release, calling on followers to participate in the “Mother of All Tweet Storms.” According to the release, followers of The Storm were “asked to create memes that express truths that have been misreported or ignored by the Main Stream Media (MSM) and call them out for their dishonest reporting.” Operation Rescue characterized the event as “a tweet war of Biblical proportions with folks joined together in a concerted effort to break through to the masses with the truth about governmental corruption, human trafficking, and even Planned Parenthood.” The Operation Rescue Twitter account then spent the better part of January 17 tweeting a variety of memes attacking Planned Parenthood and promoting hashtags related to The Storm. 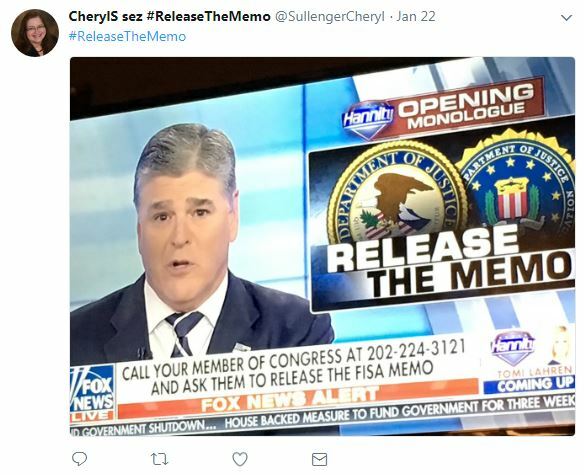 January 22 -- Sullenger tweeted #ReleaseTheMemo and included a screenshot from Fox News’ Hannity, in which host Sean Hannity was talking about it. Hannity has been an active promoter of so-called “deep state” conspiracy theories. January 24 -- Sullenger reacted to news that Planned Parenthood President Cecile Richards is leaving the organization sometime in 2018, by tweeting multiple memes of Richards depicted in prison with the hashtag #ReleaseTheMemo. 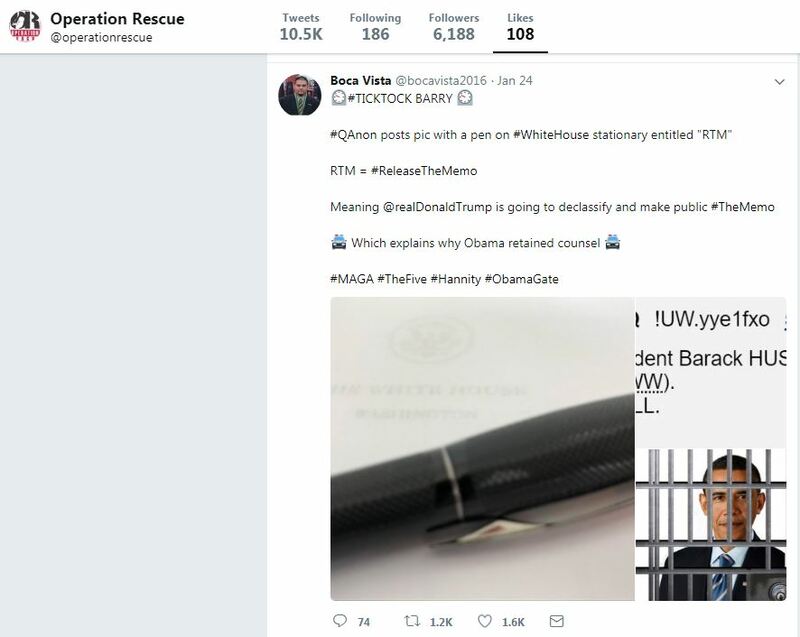 The official Operation Rescue account also tweeted a press release about Richards’ departure using the hashtags #ReleaseTheMemo and #FollowtheWhiteRabbit. Sullenger also tweeted a link to a YouTube video about #Qanon, calling it, “Must watch!” In addition to Sullenger’s Twitter activity, the Operation Rescue account also liked a tweet about #ReleaseTheMemo. January 25 -- Sullenger retweeted a video about Qanon from the account @RoystonPotter (who appears to frequently post about The Storm) and later tweeted about #ReleaseTheMemo. January 27 -- Sullenger retweeted a Jerome Corsi tweet about #ReleaseTheMemo, featuring a story from far-right blog The Gateway Pundit about Hannity and the memo. Sullenger additionally tweeted an explainer video about The Storm, writing, “#TheStorm is real. #ReleaseTheMemo.” Sullenger also tweeted @realDonaldTrump, asking him to read the memo during the State of the Union address because “Americans need to know the #truth.” Meanwhile, The Operation Rescue account liked a tweet about #GreatAwakening and #QAnon. January 28 -- Sullenger attacked Rep. Maxine Waters (D-CA) -- a frequent right-wing target -- on Twitter, citing a clip from Fox News’ Tucker Carlson Tonight. This tweet included the hashtags #GreatAwakening and #ReleaseTheMemo. 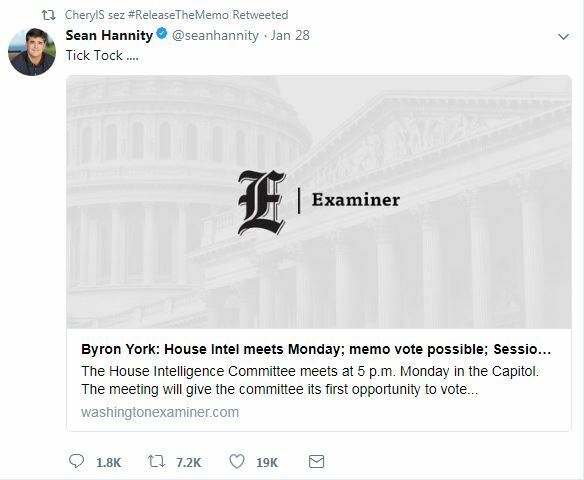 In addition to her own tweet, Sullenger also retweeted content from Jerome Corsi and Hannity about #ReleaseTheMemo. January 29 -- Sullenger quote-tweeted a claim from Corsi about the memo, writing that she would not “be happy until we can all see the memo with our own eyes.” In addition, Sullenger also tweeted about the resignations of FBI Deputy Director Andrew McCabe and Democratic National Committee CEO Jess O’Connell from their positions -- linking each to #ReleaseTheMemo. Notably, Sullenger shared an image from an account (@Thomas1774Paine) about the memo supposedly being delivered to the White House -- writing in a public post on her Facebook that “we are on the brink of history!” The Operation Rescue Twitter account retweeted a user, @LadyStephC, calling the memo “the tip of the iceberg” and including a number of hashtags related to The Storm. January 31 -- After a train crash involving Republican members of Congress, Sullenger retweeted a conspiracy theory from Corsi that suggested the accident was part of a “deep state” plot to stop the Republicans from releasing the memo. February 1 -- Sullenger tweeted several memes linked to the #ReleaseTheMemo campaign, suggesting that if the memo is released some Democratic politicians will go to jail. Another meme that she tweeted showed "Q" as a revolutionary standing up to the "deep state" and implied the only way Americans would be "free" is by following him. Sullenger retweeted “alt-right” troll Jack Posobiec, in addition to tweeting a screenshot of an 8chan message board comment (allegedly from “Q”) and including the hashtags #ReleaseTheMemo and #Qanon. February 2 & 3 -- Retweeting a comment from Trump’s Twitter account about opposition research firm Fusion GPS, Sullenger argued that the same firm had “issued fake ‘forensic analysis’” in order to “cover up [Planned Parenthood]'s illegal baby parts trafficking” -- referring to a debunked allegation from the anti-abortion group Center for Medical Progress. 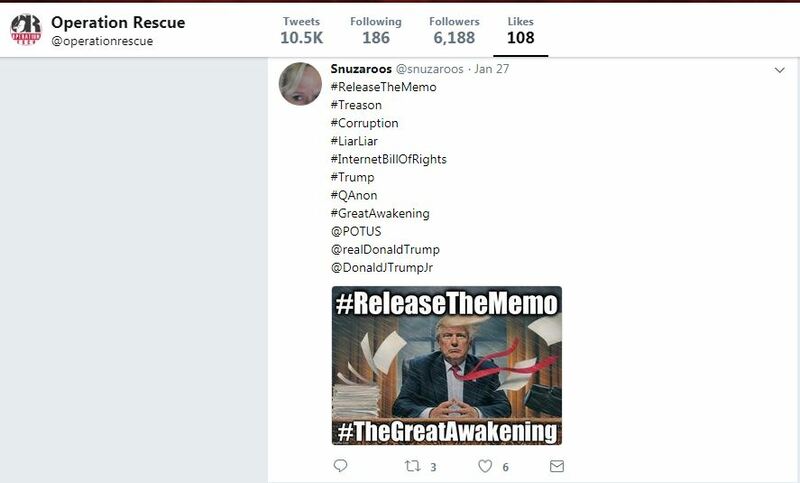 In her tweet, Sullenger included the hashtags #ReleaseTheMemo and #ThesePeopleAreSick. Sullenger also retweeted right-wing media personality Mark Levin. After the release of the disputed memo, Sullenger retweeted several of Corsi's tweets hyping allegations of widespread wrongdoing by government entities. On February 3, Sullenger retweeted Trump claiming that the memo "totally vindicates" him. February 4 -- Sullenger tweeted a video alleging that Super Bowl LII attendees were at risk of being targeted by terrorists, commenting, "Better safe than sorry!" For good measure, Sullenger also tweeted a Life News article about Planned Parenthood President Cecile Richards calling her "evil" and using the hashtags #LockHerUp, #AbortionIsMurder, and #GreatAwakening. February 5 -- Retweeting an account that previously shared screenshots from 8chan, Sullenger commented that both Clinton and Planned Parenthood "both must pay for crimes." Sullenger also shared a press release published by Operation Rescue further connecting the memo to the organization's typical talking points about Planned Parenthood. February 6 & 7 -- Sharing a post from Corsi about "Q", Sullenger excitedly tweeted "OMG!! LOOK!!!!!!!!" Sullenger also shared the LifeSite News and WorldNetDaily pickups of Operation Rescue's February 5 press release. On February 7, Sullenger tweeted several times, citing accounts that were promoting claims about the memo. Throughout much of this timeline, the social media accounts of Troy Newman did not engage as often with topics related to The Storm, #ReleaseTheMemo, or even right-wing media personalities. However, on January 31, a public post on Newman’s Facebook page directed followers to what appears to be a conspiracy theory blog for a man named Jim Stone. After the memo was released on February 2, Newman tweeted and posted on Facebook, wondering if it was "too early to call this an attempted coup" against Trump. 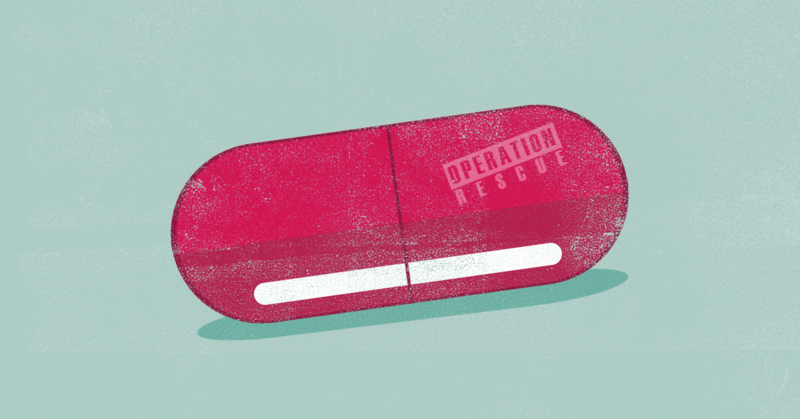 One thing is certain: If Sullenger and other members of Operation Rescue have been fully “red-pilled,” they are not only exposing their audience to a wellspring of conspiracy theories, but also potentially becoming further radicalized themselves. And if exposure to rapidly misogynist online communities is truly a “gateway drug,” as Romano warned, the cross-pollination between these 8chan conspiracy theorists and anti-abortion extremists is an incredibly dangerous prospect. 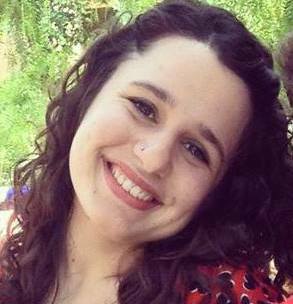 Sharon Kann is the abortion rights and reproductive health program director at Media Matters, where she has worked since December 2015. She has a master’s degree in communication from Wake Forest University and a bachelor’s degree in English from the University of Iowa.